Ready your stories and pull up a few more chairs. Make a day of it, with absolutely no reason to head back except for the occasional snack refills. Sophisticated and fresh, it has a serene feel that complements the sky and sea. Lawn loungers offer the perfect middle ground between infinity pool and oceanfront. Slowly work your way down the creative cocktail menu all week long at the oceanfront bar. Located on a private stretch of Medano Beach. Your kids will love the kid's club, arcade, beach activities and fitness classes. Enjoy a refreshing drink, such as a Mexican beer, at the poolside bar. Light-colored stone masonry and heavy wood beam arbors and accents give the Hacienda Beach Club & Residences a sense of history, while the fresh, natural décor makes it feel decidedly modern. Situated along a private stretch of Medano Beach, it has an air of welcoming sophistication about it. Adjust a lounger to the perfect reclining (and people watching) angle by the palm-lined, lagoon-style outdoor infinity pool, or choose a few on the lawn just above the beach and make that your crew’s home base for the day. The rocky Land’s End views are far more incredible in person than in photos, but you’ll want to snap a few anyway. The traditional-style, solid hardwood door to your vacation residence is the first clue that the inside’s going to be something special. It swings open to reveal an appealing open-concept, indoor/outdoor luxury home, flooded with natural light and furnished to perfection. Available in one- to three -bedroom configurations, residences feature handcrafted metalwork, natural stone finishes and a curated palette of rich textured neutrals for a look that’s still amazing even with kids’ pool toys and books strewn about. Private balconies open up to expansive views, and the full kitchen can deftly handle whatever culinary challenge you choose to take on. Plan your spa day disappearing act for later in the week, once you’ve lined up supervised activities for the kids. And be sure to book a few one-of-a-kind Cabo adventures, like a day trip to historic La Paz, a camel safari and more. The 24-hour concierge is happy to help. 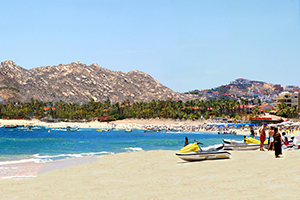 Medano Beach offers plenty of options for a good time. Rent a kayak, paddle surfboard or wave runner. Go on a hang-gliding adventure. There are several restaurants located along the beach offering everything from local flavor to seafood and hamburgers.